It has been some time since I have undertaken a watch review. I think that the reason for this is quite simply that I have not seen or owned a watch that I have felt inspired enough or indeed excited enough about to get the camera out and give wordage to. With perhaps one exception being the recently introduced Sinn 656. I did indeed own one for a very short time but was compelled to part with it as my wife gleefully arrived home one day (almost within hours of the Sinn arriving) with a horological gift; thus, guilt compelled me to offer the Sinn for sale and it was snapped up very quickly. Why mention the Sinn when I am reviewing what is essentially an unknown watch? Well, the issue is the reason why I bought the Sinn in the first place. 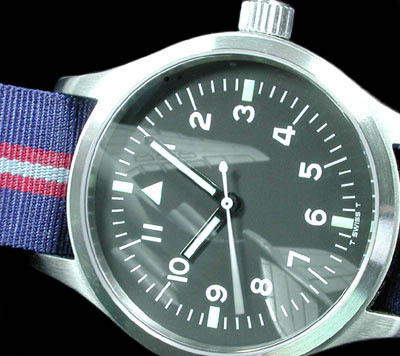 For some time I have been looking for a pure pilot/military style watch that ‘feels right’. I am not a great lover of pages of script on a watch dial, I can live without a chronograph function and I have always been attracted to the military look – indeed I have for a long time been attracted to military watches of current and past issue. 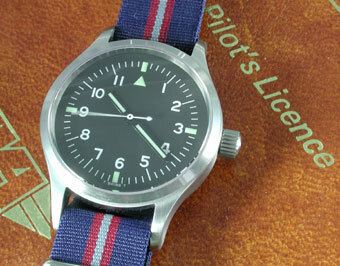 Most current issue military watches are quartz and certainly have their place and as for those British issue watches of the past which I have long admired, well, they are in my opinion not practical for an everyday watch (that is, they are too valuable and wouldn’t survive the treatment meted out by me). When I first set eyes on the Sinn 656, I thought I may have found that elusive ‘right’ watch which I could wear day in and day out and so on. I didn’t really get the chance to find out. My interest in aviation has always been in favour of civil rather than military. This stems from having been in the fortunate position as a child to accompany my father on numerous business trips around the world. These trips took place during what I consider to be the very end of the halcyon days of civil aviation and I have been a passenger on such aircraft as the De Havilland Comet, Vickers Viscount and Vanguard, Vickers VC10 (in my opinion the most beautiful airliner ever to grace the skies), Boeing 720 (remember those?) and Hawker Siddeley Trident. Having developed an interest in horology it was with much glee that I discovered that certain watches were actually issued to airline pilots; indeed my first ‘good’ watch was a Rolex GMT Master which I believe originated from a Pan American Airways requirement. 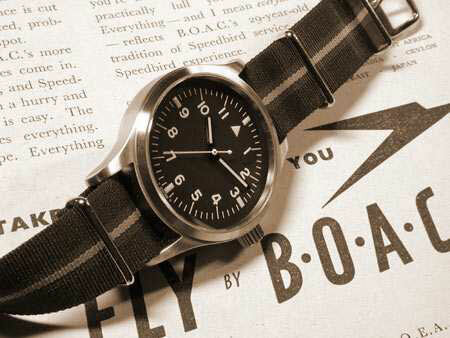 But even greater excitement ensued when via the internet I discovered that BOAC (British Overseas Airways Corporation) had at some point issued pilots with the legendary IWC Mark XI. This was a watch which appealed to me mainly in terms of its design: simple and clean with Arabic numerals. Of course it was a military issue watch first and foremost but the fact that my childhood heroes (airline pilots) may have been wearing it was the icing on the cake. I am the first to admit that many watch enthusiasts take pleasure in wearing a watch that has a ‘history’ – perhaps the most notable being the Omega Speedmaster; others are ‘weekend’ warriors and feel good wearing a military watch; others are keen to wear the watch that James Bond wears. And all this surely relates to that warm, sepia toned feel to the whole mechanical watch scene which fascinates us, which George Daniels described as ‘…living in a romantic era…’ when I met him earlier this year. All wonderful but unfortunately for me I have never been able to afford an IWC Mark XI. 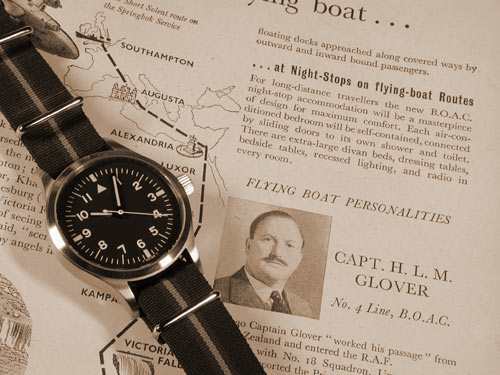 Well, to find a watch which might keep alive fond memories of my ‘good old days’ of air travel and as it happens of meeting many Royal Air Force pilots stationed in Malta (in the days of Canberras and Lightnings) would be the satisfying end of a semi-subconscious search. That watch arrived on my doorstep on Saturday 8 December 2001 and is worthy of review. I believe that Eddie Platts at Timefactors has been working on the PRS 1 for some time. I have previously purchased watches from him and seem to recall that he mentioned the project to me some months back when I was enquiring about another watch he had for sale. I gave it no more thought until I dropped in on his message board to find pictures he had posted. This needed more investigation! Such investigation consisted of approximately ten minutes of downloading the pictures, enlarging them, shrinking them, turning them upside down and finally deciding which number of the edition of 300 I should have. For whatever reason (be your own judge) I chose 007 (sorry, Steve W) and fired an e-mail off pronto. The pictures that Eddie had posted had obviously stirred something in me as I normally take an age to decide on a watch purchase and forbid, batter the credit card even more than it already is. Who knows what great conjunction was taking place in the skies but to summarise: one day I had registered a domain name for use as a history of BOAC web site, the next day my wife left the UK for a holiday (all clear for watch purchases) and the very next day I saw ‘those’ pictures. The final, uncanny twist was when I opened the box to find that this watch had the name of Speedbird – the original call sign of BOAC no less! I make no apologies for my excitement thus far, because for me this watch appeared to represent what I had wanted for a long time. Hence, for the first time I am reviewing a watch without it even having been on my wrist. After finally figuring out how to break into what seemed to be a hermetically sealed shipping box I found a double folded, double sided A4 information leaflet giving watch care information, watch setting information and a somewhat familiar watch glossary (and then I remembered an e-mail Eddie had sent me in August asking if he could use the glossary on this site). Digging deeper, I was pleased to find a rather attractive wooden presentation box with a cardboard slip-cover. I am not a great lover of what I often consider to be over-the-top packaging but this seemed an acceptable compromise. The watch sat on a C-clip covered in the beige velvet-like material also lining the interior of the box. Along with a Timefactors business card was a card of the same size, signed by Eddie Platts and filled in with the watch serial number of 007. Other information included the specifications of the watch and right at the top, the word ‘Speedbird’ which I have to admit sent a bit of a shiver down my spine! 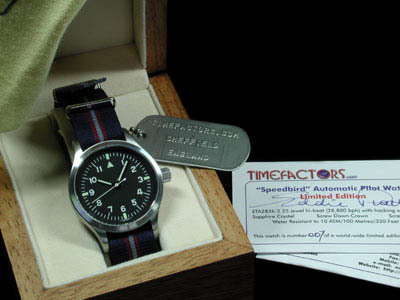 There was yet more in the form of a Timefactors signed polishing cloth and on removing the watch from the box, a novel metal stamped hang-tag rather like a military dog-tag – TIMEFACTORS.COM SHEFFIELD ENGLAND. The story wasn’t over as a spare strap dropped out from within the C-clip! A pretty comprehensive and complete package in my opinion. The only thing missing was a 1 Carat diamond to appease my wife for the inevitable ‘…why have you bought ANOTHER watch…?’ Never mind, she wouldn’t be home for another seven weeks. I am sure that many readers of this review will have at some time ordered a watch from afar with great anticipation; based only on internet based pictures such purchases can be quite nerve jarring as the moment finally arrives to open the box and see the thing ‘in the metal’. For me, this was no exception as I dreaded that deflated feeling that can occur if things aren’t up to, or are way below expectation. In this case, trepidation turned to almost disbelief; this one looked better than the pictures! On the custom designed NATO strap, the watch looked more refined than the pictures had depicted, all proportions seemed to be correct, the Arabic numerals were the right size and even the colour of the luminous compound of the hands matched that of the dial. So far, we have a watch which seems to be exactly what I wanted with all those little extras in the box that serve to make one feel that money has not been wasted and that the whole thing is good value for money. What of the detail? The case of the Speedbird is of classic British military form, albeit slightly larger in diameter at 37.5 mm as opposed to the more usual 35mm of the old-school military watches such as the aforementioned IWC and others such as the Smiths W10 which I believe was slightly smaller still. For me, the diameter is most welcome, not too large, not too small; indeed, I once owned a Smiths W10 and found it to be a little too small in terms of the wrist presence I like in a watch. Lug width is 18mm which actually makes the watch look a little larger than it really is which I am sure will be very welcome to some purchasers. The side profile of the watch once again typifies military and features the curved lugs of which I am a great fan. Luckily, the lug ends haven’t been rounded off to an extreme degree so from the side they taper to almost a Rolex-like point, but not enough to cause any discomfort. On the subject of the lugs, the area between them is finished with a fine vertical brushing which is pleasing given that it will be visible. As previously mentioned, the 18mm lug width serves to make the watch look slightly larger than it actually is but also gives pleasing proportions; in my opinion, 20mm lugs would look out of place and only serve to dilute the aesthetically pleasing shapes and curves of the lugs themselves. Again on the subject of the profile, this case would appear to be identical to the Smiths W10 albeit on a slightly larger scale. 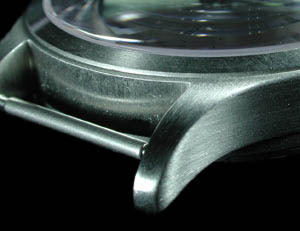 The case sides are flat – no contour at all, which is of course in keeping with the overall theme and they do not extend the full thickness of the case (11.75mm); hence when the watch is on the wrist, it looks slightly thinner than it actually is. Again, for me a welcome touch as we already have the added thickness of two layers of strap to take into account when the watch is worn with a NATO – which leads me to the springbars which are traditional as opposed to fixed. I can see many purchasers wishing to put the watch on a leather strap of some description and this is of course made a lot easier with sprung bars. So, I am pleased to report thus far that the Speedbird doesn’t seem to have been intended as a ‘copy’ of a military watch, be it a Mark XI or whatever, some consideration seems to have been given to those who wish to wear the watch for what it is rather than what possibly inspired it. The bezel forms part of the case itself and is a little over 2mm wide. This means that the size (diameter) of the crystal is such that it adds to the feeling that the watch is larger than 37.5mm and allows one to enjoy the dial (more of which later). As per the rest of the case, the bezel features a fine and well executed brushed finish which I would imagine could be easily ‘home refinished’ if necessary. The brushing on the case sides is almost satin-like and difficult to believe achievable at this price-point. Therefore, the whole of the case is of a brushed finish (always in an appropriate direction), there are no polished areas to be found and this extends to the crystal seating ring which is often to be found of a polished finish. and that is it. The back is bowled slightly to allow for the movement rotor and a most interesting touch are the slots for caseback removal which are identical to those found on the Smiths W10 of the late 1960’s. Nice! The good news as far as I am concerned is the 10 Bar water resistance, aided no doubt by the well-proportioned screw-down crown which features plenty of thread. 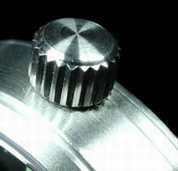 The crown itself features keenly cut serrations and whilst not being signed, has an attractive circular machined finish. Overall, I have to give the case of the Speedbird full marks for style, execution and finish – for my purposes I can’t really fault it. Military purists might decry the use of a screw crown and a lack of any anti-magnetic measures such as the IWC inner iron shield and so on which is fair enough, but for practical purposes I know I can safely swim with this watch and given my lifestyle, I am unlikely to venture into the magnetically intense depths of volcanoes, power stations an so on! 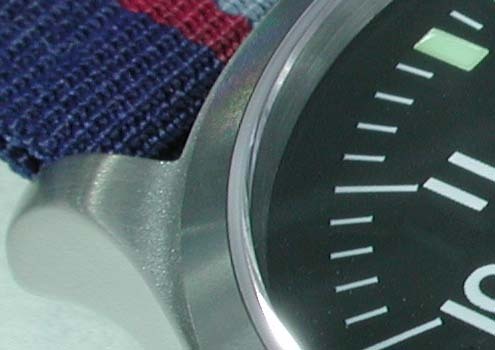 The dial of a watch is of course the most ‘interactive’ component. It is what we look at many times a day. Some may consider it to be the most important aspect of a timepiece. And it is quite often where a watch is let down badly or at least where the manufacturer seems to have lost all taste. Quite obviously, the dial design of the Speedbird is not original to this watch. Indeed, it stems from a British Ministry of Defence requirement of decades ago. In this respect lies the closest resemblance to certainly the IWC Mark XI and that suits me fine. 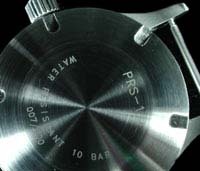 In this case however there is nothing on the dial save for the ‘T Swiss T’ at the bottom, signifying the use of Tritium as the active ingredient in the luminous compound. This style of dial has long been admired for its clarity and still exists today in extremely similar form on current British military issue watches. This version is the epitome of clarity and is of classic pilot’s style. What has been omitted in this case are any circle T’s or Broad Arrows so often seen on pseudo-military watches. This dial is as pure as they get! Eddie Platts was not even tempted with a small ‘PRS 1’ under the 12. A blank dial as it were might be an acquired taste; indeed, this style of dial might not be to everybody’s taste. On the first point I would assume that this watch has been intended as a practical timekeeper, without frills of any sort. Given the positioning of the Arabic numerals then there isn’t a great deal of room for much else on the dial; in this respect, it doesn’t look empty. Were the watch say 40mm in diameter then things might look a little different. On the second point, you either like Arabic numerals or you don’t – therefore those who prefer baton markers are unlikely to purchase this watch – fair enough. The rectangular markers at 3, 6, 9 and 12 are luminous as is the small triangle below the 12. I assume that the compound features Tritium as the bottom of the dial is marked thus. 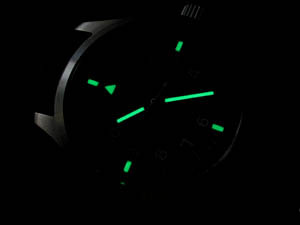 Having tried the watch in darkened room in the dead of night the illumination seems to be very effective and the afterglow would certainly indicate the use of Tritium. What is interesting is the quality of the application of this compound. Rather than the printed look which I have seen on many lower priced watches this has the shiny, ‘globular’ look that you would find for example on the Omega Seamaster – the depth of the compound is therefore reasonably thick which should theoretically aid a long, bright glow. Application is uniform and no ragged edges are present. The Arabic numerals also stand slightly proud of the dial and are a glossy white; as per the luminous markers, the application of these is very well executed, crisp and without ‘holes’. The minute hashes which are extended in length at the 5 minute markers are likewise very well applied – being straight and uniformly white. Forgetting the design for a second, I am finding it hard to believe that a dial of this quality is possible on a watch of this price. The closest I think I have seen in terms of a direct comparison of numeral/luminous application might be the now discontinued Omega Dynamic. The dial itself is matt black or if one were to be 100 percent accurate – an extremely dark charcoal. I don’t believe that a pure black is possible unless a glossy or enamel finish is chosen (e.g. the Rolex sports watches). Nothing much else to comment on in this regard, suffice to say that there is plenty of contrast between the markers/numerals and the dial itself. The hour and minute hands are of a glossy black finish. When I saw the pictures which had been posted of the watch I wasn’t quite sure what colour they were or indeed, if they were black whether this was the correct way to go. Having seen the watch in the metal I have come to the conclusion that they are perfectly acceptable as they are. It is possible of course that others might prefer a white metal or chromed finish for reasons of contrast. If that is the case, be assured that the luminous fill of the hands provides excellent contrast for timekeeping purposes. The hour hand is a plain rectangle with a squared tip, the minute hand also rectangular but with a small pointed tip. The seconds hand is finished in a gloss white which matches the numerals. The Speedbird features a very slightly domed sapphire crystal. I assume that the use of this may have been simply to bring the watch up to date as it were and to preclude the wearer from having to polish scratches out on a regular basis. I am a lover of acrylic crystals for reasons which I have stated in other watch reviews and as a rule prefer watches to be fitted with them. So, if I were to be totally honest I would say that for me, an acrylic would have been a nice touch and if you will, more traditional. The good news is of course that a mineral crystal was apparently not even considered thus the sapphire was specified. Well, it isn’t going to scratch and it seems flush enough with the case for chips to be avoided with a reasonable amount of care. Again, given the price of this watch, inclusion of a sapphire crystal is to be commended. Reflections are as to be expected with a sapphire (i.e., more than with an acrylic) but I am happy to live with those given the scratchproof nature of this material. Of course, this movement is a derivative of the ubiquitous 2824, the lineage of which extends back to the 1960s and before. In its various forms it has been and is still used in countless watches by countless manufacturers. My experiences bear out that this family of movements are strong and reliable workhorses which are capable of good accuracy and steady rates over long periods of time. Purists, or those who might seek to directly compare this watch with the originals which may have inspired it might suggest that a lower beat (even manual wind) movement would have been more appropriate and maybe they have a point if such a comparison is being made. Given that the watch is equipped with a screw crown and a sapphire crystal then in this case, I am happy to live with the modernity (and the potential for less variation in rate) that the high-beat movement represents. As for timekeeping of my example, then I can only report at this stage that out of the box, the watch appears to be gaining 8 seconds per 24 hour period but it is very early days and a true measure of accuracy won’t be possible for a while. The Speedbird comes complete on what is a new style of NATO strap which I assume has been specifically designed for the watch. 18mm in width, the strap is manufactured to exact MOD specification in terms of dimensions, construction and ‘furniture’. To my eyes the colour combination looks more civil than military and is something of a change from the usual grey NATOs that seem to find their way onto every watch that I own! Those who have read my other watch reviews with be familiar with my strange obsession with NATO straps. 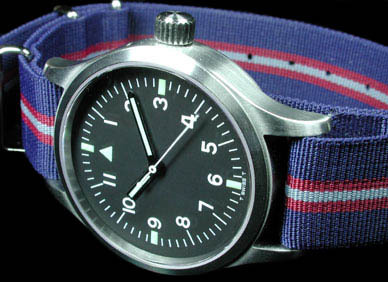 As it happens, I wouldn’t wear this watch on anything other than a NATO, I rather like the colour design of the supplied strap though it is likely to end up with the grey! I have no doubt that the watch would look good on a leather strap and of course strap changes will be very easy given the sprung bars. I stated at the very beginning of this review that the watch for which I had been searching for some time had arrived. I stand by that statement. Having looked at it in more detail, I can only say that without a shadow of a doubt, the Speedbird will become the watch that I wear over and above all others that I own. Indeed, some will be disposed of – I just won’t use them any more. It is for me the blend of old and new which I have wanted in a watch that will evoke good memories and so on. That is the emotional side of the story from my perspective. Practically, this watch reaffirms my commitment to the notion that a quality watch does not need a ‘name’ and does not necessarily require a second mortgage in order to purchase it. Furthermore, the Speedbird may serve to dispel a few myths or at least raise a few questions regarding the price justification of one or two similar ‘name’ watches costing multiples of its price. I believe that those who purchase this watch will see exactly what I mean when they experience first hand the quality of the case, dial and the overall specification. The question is of course, who might this watch be suitable for? Well, as examples I would suggest that those who collect military watches but who would prefer to wear something where damage wouldn’t matter should have one along with those who like this ‘look’ but aren’t impressed with ‘names’ and the price tags that often go with them. And the price? GBP195.00 or about USD285.00 as at the time of writing. Highly recommended! Tagged PRS-1, Speedbird, Speedbird I, Timefactors. Bookmark the permalink.